Travertine is an advanced form of limestone, a sedimentary rock, formed from the carbonate minerals of hot springs that have been under pressure for thousands of years. The stone’s unique beauty is a result of the extreme pressure and chemical reactions that have taken place over the centuries. While travertine has been recognized as a popular and durable building material for centuries, homeowners continue to enjoy the timeless style and unique beauty of travertine flooring today. 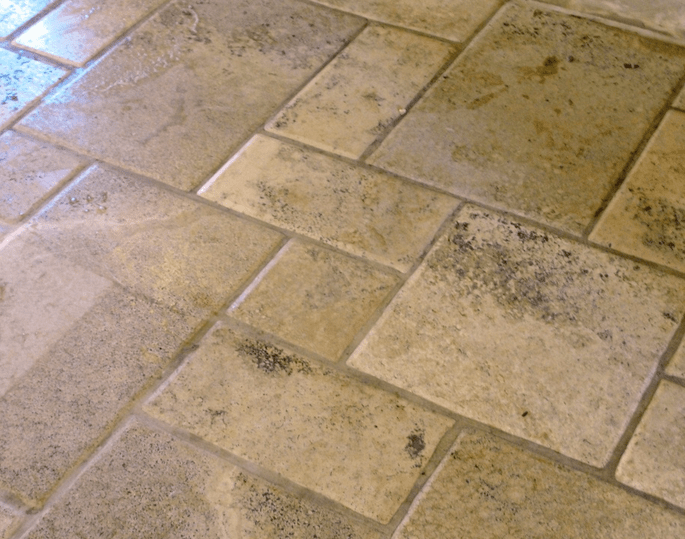 The soft, matte finish of travertine stone tiles is perfect for flooring for kitchens, baths, hallways, and living areas. Natural travertine tile is available in colors from ebony to very light with shades of plum, gray, tan, brown, copper, gold, and all combinations. Surface textures may be smooth or tumbled. The broad array of shades and textures offer a wonderful opportunity for home or business owners to create a truly unique flooring presentation by adopting a unique pattern. Taking advantage of the variety of travertine tile sizes, orientations, and shapes in differing patterns, a new floor can take on an elegant, sophisticated, or relaxed style. Straight Style: To convey a conservative, formal look to a room, the conventional straight style of pattern is the simplest. Square tiles are aligned with square tiles parallel to the existing walls to highlight the beauty the flooring throughout. Versailles Style: Utilizing multiple sizes of rectangular and square travertine tile pieces, this classical pattern is developed from seemingly random placements to create an irregular pattern. In truth, placement is pre designed with a set ratio of different sizes of rectangles and squares. Diagonal Style: Square travertine tiles of equal sizes may be aligned at a 45° angle to outer walls or to the entryway to create a diagonal pattern instantly noted as you enter the room. This orientation can make a room feel larger. Pinwheel Style: This pattern is created by placing four larger rectangular tiles around single small square tiles, Repeating this pattern throughout the room creates that unique and eye-catching pinwheel effect. To learn more about genuine travertine stone floor tiles for your home or office, contact the experts at PetraSlate Tile & Stone in Denver. Visit the PetraSlate website for many new flooring and wall ideas or phone (303)-280-9595.